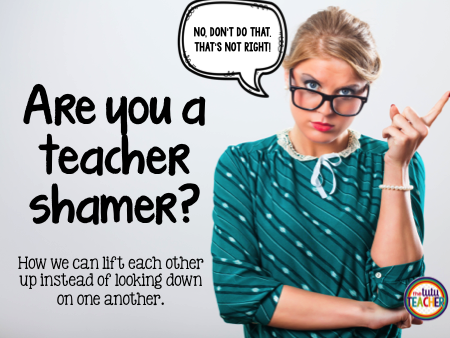 Are you a teacher shamer? Disclaimer: It's about to get a little real. And I'm not trying to be rude, these are just my opinions. I love teachers. I love that we share ideas, thoughts and products with each other. I love that each day we wake up and spend time with other people's children and love them like they were our own. I love that teachers are willing to try new ideas and stand up for what they think is right for their students. I don't love teacher shaming. What is teacher shaming exactly? Teacher shaming happens when a teacher expresses his or her idea as if it is the only idea suitable for the classroom. As if no other ideas are worth mentioning or entertaining. Curious teacher: I'm thinking of using a behavior chart in my classroom this year. Teacher shamer: Behavior charts shame children and should never be used in a classroom. Thought provoking teacher: I know many teachers who use behavior charts and many who do not. Why do you want to use one this year and how do you plan on enforcing it in your classroom? Curious teacher: I just finished decorating my room and I love it! There's so many colors, my kids are sure to love it. Teacher shamer: Too much decor and color distracts students from learning. Keeping a room clean and simple is the best way to decorate. Thought provoking teacher: Your room looks great! Have you thought about the learning styles of your students and any learning accommodations you may need to make? Those are just a few examples. The point is, what you do as a teacher in your classroom is awesome. You're awesome. And sharing your ideas and opinions with other teachers is awesome too...but pushing your viewpoint as the only or "right" view is a little rude... it discourages other teachers from sharing their own ideas and can make new teachers feel like there is only one way to do something or one way to teach. Don't we teach our students that the best way to learn something is to try? Why wouldn't we encourage that in our colleagues? By trying new ideas, teachers begin to figure out what really works for them and their students. They develop a sense of their teacher self and isn't that exactly what we want to foster in each other? When we want to know about the practices of another teacher we should ask "curious questions". Curious questions help others to talk out their thinking and analyze the choices they've made. Telling a teacher that what she or he is doing is not the "right" way, doesn't foster thinking, but stunts it. We should practice lifting up one another, instead of looking down on each other. Love this! Coaching and questioning and supporting each other is the way to go. I agree 100%. I don't know why teachers have this innate need (some of them anyway) to judge each other the way we do. Whatever works in your classroom is the "right" way to do it! Thanks for sharing! I agree and it doesn't make sense for teachers to bash each other when they could actually empower and help each other to be better. I thought I was the only one who noticed this.